We’ve released a SIP connector for Bitrix24 telephony. 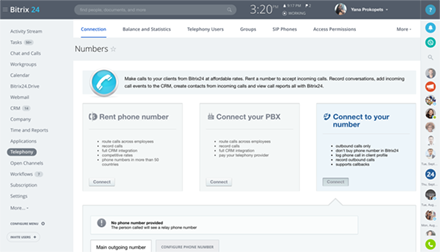 What it means is that you can now connect your existing PBX, both cloud and your physical office PBX, to Bitrix24 and get all the benefits of our free CRM. 2. Second, you’ll pay for the phone calls to your current IT telephony provider at the rates that you chose. 3. Third, you’ll get access to features that you probably did not have, like ability to record phone calls, create a new lead automatically when someone new calls you, or automatic forwarding of phone calls to a responsible manager when an existing client calls from a phone number that’s listed in your CRM. The cost of using SIP connector is only $49/mo. Bitrix24 cloud users can find instructions how to connect their PBX here. If you use self-hosted edition of Bitrix24, the instructions are a little different. Please note that Bitrix24 helpdesk DOES NOT offer SIP connector setup help, as PBX settings are configured individually on the client side and may vary significantly from vendor to vendor. You can, however, hire Bitrix24 partner near you to connect your PBX to Bitrix24 if you are unable to do so on your own, and can provide remote access to a partner technician.